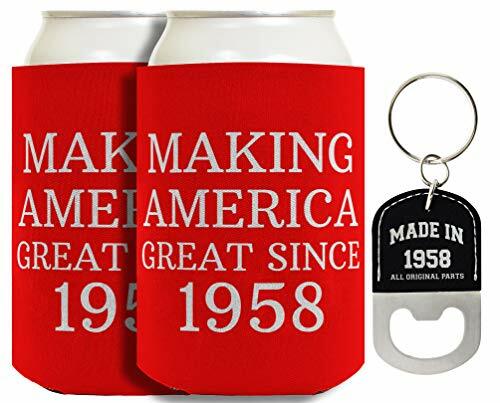 60th birthday coolies make excellent birthday party favors or a funny 60th birthday gift perfect for celebrating that special milestone. This vintage style can cooler is perfect for keeping your drink cool while the party heats up. Coolies make a great gift or party favor. They are a memento with purpose and lasting value. Premium 1/8 inch thick high density open cell polyurethane foam keeps your drink perfectly insulated. Coolies fold flat for easy storage and are machine washable. 60th birthday coolies make excellent birthday party favors or birthday gifts to celebrate a 60th birthday. The pictured can coolie design will be featured on both sides of the coolie so that you can see it from every angle. You will receive 2 can coolies. Premium full color sublimation printing creates vibrant and long lasting colors. Holds 12 oz cans or 12-16 oz bottles. Folds flat for easy storage. Premium 1/8 inch thick high density open cell polyurethane foam keeps beverages cool. Machine washable. The keytag design is precision laser engraved on one side of the keychain, while the other side remains plain leather. Laser engraving ensures a long-lasting design that will stand up to everyday use. This unique bottle opener keychain is perfect for opening bottles of your favorite beverage. You can take this bottle opener key tag with you everywhere you go. If you have any questions about this product by Birthday Gifts For All, contact us by completing and submitting the form below. If you are looking for a specif part number, please include it with your message.